[San Juan Islands, WA]—Today, the National Endowment for the Arts announced that Ian Boyden will receive an NEA Literature Translation Fellowship of $12,500. Ian Boyden is one of 25 Literature Translation Fellows for fiscal year 2019. In total, the NEA is recommending $325,000 in grants this round to support the new translation of poetry and prose from 17 countries into English. The fellowship is being awarded to support the translation from the Chinese of the poetry collection Minority by Tibetan poet Tsering Woeser. Woeser (b. 1966) is considered one of China’s most respected living Tibetan writers. Her Tibetan heritage is central to her work, whose themes include alienation due to the ongoing and often violent erosion of Tibetan culture. Minority is a 120-page collection comprising roughly 35 poems. The translation is particularly complex, as Woeser is conveying the Tibetan experience using Chinese language. As a young girl in the Cultural Revolution, Woeser was “re-educated,” meaning Chinese was taught in schools to replace the mother tongue. Her poems confront sensitive topics such as the wave of self-immolation that has swept through Tibetan society in the last decade, and the destruction by the Chinese government of Larung Gar, the largest Buddhist academy in the world. John Kerry of the U.S. State Department gave Woeser the International Women of Courage Award in 2013. In 2010, she was also was honored with a Courage in Journalism Award from the International Women's Media Foundation. A human rights advocate, Woeser has been under intermittent house arrest for the past several years, and was only recently allowed to return to her Tibetan homeland for a limited time. Ian Boyden is a translator, writer, artist, and curator. His translations of Woeser's work have been published on leading human rights and Tibetan cultural websites, including Radio Free Asia, Invisible Tibet, and High Peaks Pure Earth. His translation of her poem “The Spider of Yabzhi Taktser” was declared the most-read translation of a Tibetan poem in 2017. Boyden studied for many years in China and Japan, and holds degrees in the History of Art from Wesleyan University and Yale University. Asked how his interest in Woeser’s poetry developed, Boyden says, “My friendship with Woeser started in an unusual way. Several years ago, I carved a huge self-portrait out of wood, and when I finished carving it, I lit it on fire, thinking it was a statement about forest fires here in the Pacific Northwest. Instead what I saw burning before me was a statement about self-immolation. So I wrote to Woeser, who had written a book titled Tibet on Fire about the huge number of self-immolations that have occurred across Tibet in recent years in protest against the Chinese occupation of that country. To my amazement she wrote back to me.” That conversation continued, and they still write to each other several times a week. 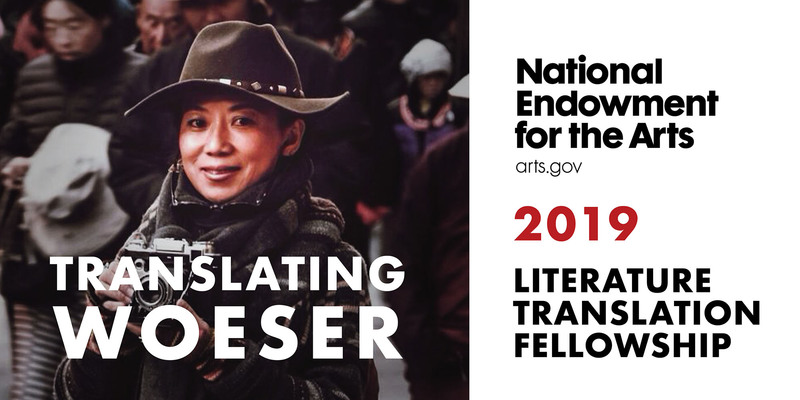 Since 1981, the NEA has awarded 480 fellowships to 425 literary translators, with translations representing 69 languages and 83 countries. The review criteria for these projects consist not only of the translators’ skill, but also the importance of a particular work to English-speaking audiences, including those authors and languages that are often underrepresented.